Chief executive Richard Pike also said universities were increasingly having to run remedial classes in maths. Dr Pike said: "Schools and students are reluctant to consider A-level mathematics to age 18, because the subject is regarded as difficult, and with league tables and university entrance governed by A-level points, easier subjects are taken." In a paper entitled Why League Tables Have to Go, he said it was not unusual for students taking chemistry and biology to take another non-mathematical "quite unconnected" subject. He went on: "Increasingly, universities are having to mount remedial sessions for incoming science undergraduates because their maths skills are so limited, with many having stopped formal lessons in mathematics two years earlier at the GCSE level." This contrasted strongly with countries like China where maths was taught to all up to the age of 18, he said. The society has set people a challenge of completing a Chinese pre-entry maths test, and published a first year English equivalent for comparison. Dr Pike said: "Mathematics tests set in England by many universities for undergraduate chemistry students in their first term to diagnose remedial requirements are disconcertingly simple. "They encapsulate the challenge facing this country." He called for a national investigation into how to tackle the issue. 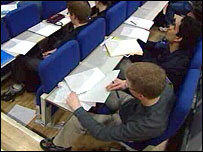 But the society has been accused by a maths professor of a "cheap and uninformed" attack on UK teaching. William Shaw, professor of financial mathematics at King's College, London, said he had taught students from many countries and their training differed. Within the Uk the emphasis had shifted over the years. Where once there was "a huge amount of geometry and algebra", students these days spent more time on statistics, probability and data interpretation. "I recall admitting and then teaching some very bright and well-taught Chinese students while a tutor in Oxford," he said. "At school these students had done lots of geometry, algebra and all kinds of puzzle-solving. "But I found myself having to teach introductory calculus to some of them. Some had just not done it." Similarly, in the United States, many good students might not learn calculus until they got to college. A Department for Education and Skills spokesman said the numbers of pupils studying science, maths and further maths was increasing. "This trend is repeated at university level where 120,000 more young people are studying for science-related degrees than in 1997-98," he said. "We are changing the curriculum, creating a new entitlement to give more pupils the chance to study separate physics, chemistry and biology GCSEs and piloting 250 science clubs for 11 to 14-year-olds." Some £30m was being spent over the next two years on recruiting 3,000 extra science teachers and encouraging more students to study sciences, he added.